Can you tell me the features for SMS (Short Message Service) Service in Union Bank of India as I want to make a balance enquiry? 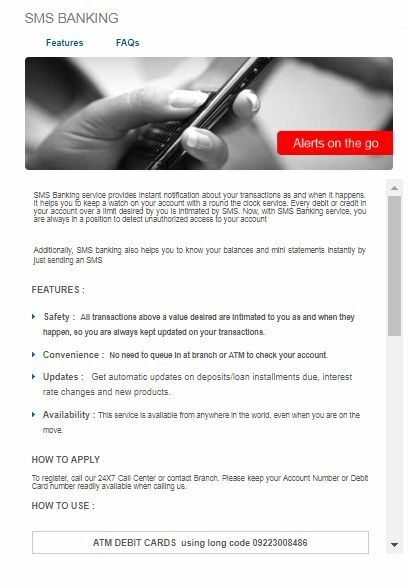 SMS (Short Message Service) Banking service in Union Bank of India provides instant notification about transactions as and when it happens. It helps to keep a watch on account with a round the clock service. Every debit or credit in account over a limit is intimated by SMS. Now, with SMS Banking service, one is in a position to detect unauthorized access to account. SMS banking also helps to know balances and mini statements instantly by just sending an SMS. All transactions above a value desired are intimated as and when happen, so one is always kept updated on transactions. No need to queue in at branch or ATM to check account. Get automatic updates on deposits/loan instalments due, interest rate changes and new products. This service is available from anywhere in the world, even when one is on the move. To use SMS Banking, one needs to know what message to send to which number to get the desired transaction carried out. For all codes listed below, one needs to send the SMS to 09223008486. To block card, send UBLOCKLast four digits of card number. To know balance, send UBALAccount number. To know balance on a secondary account, send UBALAccount number. For mini statement, send UMNSAccount number. To know the status of cheque, send UCSRcheque number. If cheque is sent to a secondary account, send UCSRcheque numberAccount number. To find the nearest Union Bank of India Branch, send UBRANCHPinCodeLocation/city. To find the nearest ATM, SMS UATMPinCodeLocation/city. To seed Aadhaar number to bank account, send UIDAccount numberAadhaar number. One can also find out balance by giving a missed call on 09223008586.